How do I Shop Small and Win up to $500? 1. 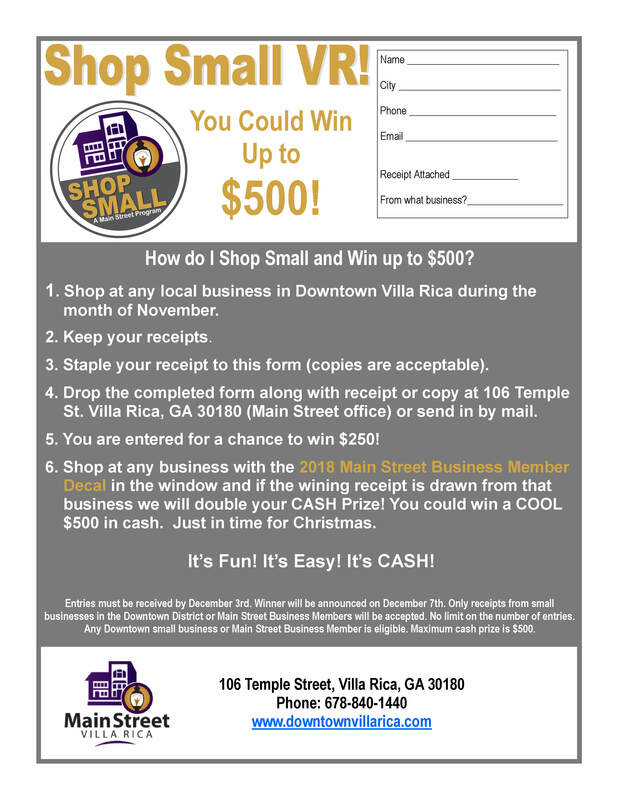 Shop at any Main Street Business Member or local business in Downtown Villa Rica during the month of November. 3. Staple your receipt to this form (copies are acceptable). 4. Drop the completed form along with receipt or copy at 106 Temple St. Villa Rica, GA 30180 or send in by mail. 5. You are entered for a chance to win $250! 6. Shop at any business with the 2018 Main Street Business Member Decal in the window and if the wining receipt is drawn from that business we will double your CASH Prize! You could win a COOL $500 in cash. Just in time for Christmas. Entries must be received by December 3rd. Winner will be announced on December 7th. Only receipts from small businesses in the Downtown District or Main Street Business Members will be accepted. No limit on the number of entries. Any Downtown small business or Main Street Business Member is eligible. Maximum cash prize is $500! History: In 2010, and small businesses were hurting from an economy in recession. In an effort to support local shops that make our communities strong, American Express launched Small Business Saturday® on the Saturday after Thanksgiving — to encourage people to Shop Small and bring pre-Holiday shopping to small businesses.